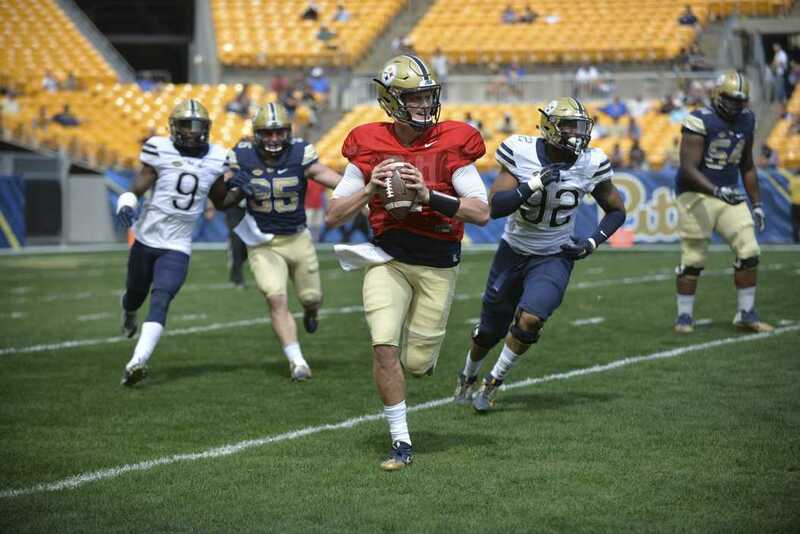 With less than two months until the start of the 2017 college football season, Pat Narduzzi and the Pitt football program are preparing for fall camp and the opening week game against the Youngstown State Penguins. This weekend, Narduzzi, senior cornerback Avonte Maddox and redshirt junior offensive lineman Brian O’Neill attended the annual ACC media day in Charlotte, North Carolina. Several things stuck out when the team released their depth chart last week, but listing Browne as the starting quarterback is the one with the biggest impact, even though Narduzzi maintains that Browne’s competition with redshirt sophomore Ben DiNucci is far from over. Browne — a former five-star recruit — transferred to the Panthers this winter for his fifth and final year of eligibility. This past season, he played for the University of South Carolina Trojans of the Pacific-12 conference, starting three games before being replaced by freshman Sam Darnold. Browne’s only performance in a Pitt uniform thus far was a lackluster 13-for-28 outing in the Blue-Gold Game on April 15. Narduzzi said this week that Browne has improved over the summer — along with the rest of the quarterbacks — thanks to new offensive coordinator and quarterbacks coach Shawn Watson. “Shawn Watson … has done a great job of identifying the strengths and weaknesses of that quarterback group and I’m very happy with the depth that we have at that position,” Narduzzi said at his press conference. With little starting experience though, Browne still has a lot to prove going forward. The Panthers offense was one of the best in college football last season, putting up an average of 40.9 points — 10th best in the country. But with quarterback Nathan Peterman and running back James Conner both gone, this year’s unit will look a lot different. Though perhaps a bigger loss than those stars is former offensive coordinator Matt Canada, who left for LSU in December. Canada was the mastermind of the offense, adding jet sweeps, shovel passes and other unique plays to the Panthers’ traditional power running game. Watson will try to replicate the success, and Narduzzi will give him the freedom to make the changes he wants. After four years in the hectic ACC Coastal, the Panthers have yet to stand atop the division and make it to the ACC Championship. They’ve been close several times, finishing with at least a share of second place in each of Narduzzi’s two years. Now entering his third season, Narduzzi is raising the expectations for his program. “We’ve been close the last two [years], but close isn’t good enough. We have to get it,” Narduzzi said. Four different teams have won the division since the Panthers joined the ACC in 2013, with Miami and Virginia being the only other programs not to make it to the title game. One could argue the Panthers have had the talent to get there, but it will be tough for the team to win the division this year given the losses it sustained on both sides of the ball. A poll of 167 media outlets, released Monday, reflects this turnover. The Panthers were picked to finish fourth behind Miami, the overwhelming favorite, Virginia Tech and Georgia Tech. More than likely, Narduzzi and the Panthers are still one or two years away from making it to the conference championship game. But, as the team has learned, anything can happen in the Coastal. Seven months after the end of the 2016 season, Pitt’s secondary deficiencies are well documented. The unit gave up the second most passing yards in all of college football last season and was the main culprit in several of the team’s defeats. Senior cornerback Avonte Maddox isn’t dwelling on the past though, instead looking to use last year’s experience to make him a better player. Despite losing starters Terrish Webb and Ryan Lewis, the secondary as a whole should be more experienced, with Maddox entering his third year as a starter and 2015 ACC Rookie of the Year Jordan Whitehead returning at safety. But despite the added experience, the unit still has to prove they have the talent to keep up with power-five competition. It shouldn’t take long to find out, as the team faces two high-powered offenses in Penn State and Oklahoma State in September. One of the upperclassmen expected to lead the Panthers’ offensive line this fall, Bookser was arrested in May on several charges, including driving under the influence of alcohol. Narduzzi offered no update on a possible punishment, saying he would announce his decision sometime before the start of the season. Bookser is the third player to be arrested on DUI charges in Narduzzi’s tenure. In 2015, he suspended senior defensive end Rori Blair and former wide receiver Tyler Boyd for the opening game against Youngstown State after they faced similar charges. With the much-anticipated rivalry game against Penn State in week two, it will be interesting to see whether or not Narduzzi elects to have him play.